I'm-Yunity™ (PSP) is a mushroom extract derived from deep-layer cultivated mycelia of the patented Cov-1 strain of Coriolus versicolor (CV), which contains as its main bioactive ingredient a family of polysaccharo-peptide with heterogeneous charge properties and molecular sizes. I'm-Yunity™ (PSP) is used as a dietary supplement by cancer patients and by individuals diagnosed with various chronic diseases. Laboratory studies have shown that I'm-Yunity™ (PSP) enhances immune functions and also modulates cellular responses to external challenges. Recently, I'm-Yunity™ (PSP) was also reported to exert potent anti-tumorigenic effects, evident by suppression of cell proliferation and induction of apoptosis in malignant cells. We investigate the mechanisms by which I'm-Yunity™ (PSP) elicits these effects. Human leukemia HL-60 and U-937 cells were incubated with increasing doses of aqueous extracts of I'm-Yunity™ (PSP). Control and treated cells were harvested at various times and analyzed for changes in: (1) cell proliferation and viability, (2) cell cycle phase transition, (3) induction of apoptosis, (4) expression of cell cycle, apoptogenic/anti-apoptotic, and extracellular regulatory proteins. Aqueous extracts of I'm-Yunity™ (PSP) inhibited cell proliferation and induced apoptosis in HL-60 and U-937 cells, accompanied by a cell type-dependent disruption of the G1/S and G2/M phases of cell cycle progression. A more pronounced growth suppression was observed in treated HL-60 cells, which was correlated with time- and dose-dependent down regulation of the retinoblastoma protein Rb, diminution in the expression of anti-apoptotic proteins bcl-2 and survivin, increase in apoptogenic proteins bax and cytochrome c, and cleavage of poly(ADP-ribose) polymerase (PARP) from its native 112-kDa form to the 89-kDa truncated product. Moreover, I'm-Yunity™ (PSP)-treated HL-60 cells also showed a substantial decrease in p65 and to a lesser degree p50 forms of transcription factor NF-κB, which was accompanied by a reduction in the expression of cyclooxygenase 2 (COX2). I'm-Yunity™ (PSP) also elicited an increase in STAT1 (signal transducer and activator of transcription) and correspondingly, decrease in the expression of activated form of ERK (extracellular signal-regulated kinase). Aqueous extracts of I'm-Yunity™ (PSP) induces cell cycle arrest and alterations in the expression of apoptogenic/anti-apoptotic and extracellular signaling regulatory proteins in human leukemia cells, the net result being suppression of proliferation and increase in apoptosis. These findings may contribute to the reported clinical and overall health effects of I'm-Yunity™ (PSP). Throughout history, mushroom and mushroom products have always been revered as food delicacies and are also held in high esteem for their overall health benefits in many cultures, particularly the Orient [1–4]. In East Asian societies, a variety of mushrooms are sold either fresh or as dietary supplements. These products are frequently consumed depending on season of the year as prophylactic measures for common ills and to improve the general well-being of individuals . The notable regard mushrooms are given for promoting wellness of the public at large is perhaps in part attributed to the rather extensive anecdotal and scientific evidence reporting their disease preventive properties, focusing mostly on the potentiation of immune functions and regulation of biological responses [3, 4, 6]. Beginning in the 1990s, however, it has become increasingly clear that mushrooms, mushroom extracts, and indeed plant/botanical polysaccharides in general, have activities beyond that of the immune system, with suppression of tumorigenesis having the most medical relevance and significance [7–10]. Thus, for instance, polysaccharides with 6-branched 1,3-β glucan structures isolated from the cultured fruit body of edible mushroom Sparassis crispa reportedly show antitumor activity when tested against Sarcoma 180 in the ICR strain mice [11, 12]. Antineoplastic activity has been demonstrated in polysaccharides isolated from Pleurotus tuber-regium, and from fruit body of cultivated Agricus blazei[14, 15]. Several polysaccharide-peptide, and polysaccharide-protein complexes with immunomodulatory and antitumor activities have been isolated and purified from mycelia cultures of Tricholoma Sp., an edible mushroom native to Hong Kong [16–18]. Maitake, a mushroom indigenous to northeastern Japan, is recognized as a rich source of polysaccharides with a wide-range of biological and medicinal properties [19, 20]. Most notably, gel-purified D-fraction from Maitake characterized as heterogeneous β-(1→6)-branched β-(1→3)-linked alkali-soluble and acid-insoluble polysaccharides , show bioactivities spanning the control of immune response, suppression of tumor proliferation, induction of apoptosis, inhibition of metastasis, and regulation of angiogenesis [10, 21, 22]. Additionally, mushrooms reportedly also contain antitumor proteins capable of inducing apoptosis as well as cell cycle checkpoint arrest in cultured malignant cells . Dietary supplements derived from edible mushroom known as Yunzhi, or Coriolus versicolor (Trametes versicolor, Fr.) – known as one of six Zhi's recorded in the "Shen Non Compendium Medica" some 2000 years ago – reportedly also show a number of medicinal properties [2, 24, 25]. Structural and functional analyses of Yunzhi have benefited from the discovery of the patented Cov-1 strain of Coriolus versicolor in 1984–1987 by Yang and coworkers, through an exhaustive screen of a large number of strains of Yunzhi [1, 4, 26]. Subsequently, an innovative industrial scale cultivation method using the mycelia of Cov-1 was developed, which led to the serendipitous discovery, isolation and purification of a family of polysaccharo-peptide, denoted I'm-Yunity™ (PSP) [4, 25, 27]. I'm-Yunity™ (PSP) has demonstrated potent immunomodulatory and antitumor activities in tissue culture studies, based principally on data using flow cytometry [27–31]. In previous studies, we have observed that ethanol and water extracts of I'm-Yunity™ (PSP) exerted dose- and time-dependent anti-proliferative effects in human promyelocytic HL-60 leukemic cells. Flow cytometric analyses showed that low doses of ethanol and water extracts of I'm-Yunity™ (PSP) induced partial cell arrest in the G1 phase, whereas high doses resulted in apoptotic cell death. Moreover, water extracts were found to have significantly more pronounced anti-cellular effects than ethanol extracts . In addition, water and ethanol extracts of I'm-Yunity™ (PSP) markedly increased the secretion of IL-1β and IL-6 with concomitant reduction of IL-8 in HL-60 cells, while having no affect on growth and lymphokine expression in normal human lymphocytes . The molecular details by which I'm-Yunity™ (PSP) exerts its biological effects remain incompletely understood. To further investigate the mechanism of action of I'm-Yunity™ (PSP), we studied the effects of water extracts of I'm-Yunity™ (PSP) on growth, viability and cell cycle traverse using human HL-60 and U-937 leukemia cells. We found a similar degree of inhibition of cell growth and induction of apoptosis, accompanied by differential targeting of G1/S and G2/M cell cycle phase transition, respectively, in the HL-60 and U-937 cells. Furthermore, in HL-60 cells, we showed that growth suppression by water extracts of I'm-Yunity™ (PSP) was correlated with time- and dose-dependent inhibition of retinoblastoma protein Rb expression. Correspondingly, induction of apoptosis in I'm-Yunity™ (PSP)-treated cells – evident by cleavage of poly(ADP-ribose) polymerase (PARP) from its native 112-kDa form to the 89-kDa truncated product – was matched by a significant decrease in the expression of anti-apoptotic proteins bcl-2 and survivin, and an increase in apoptogenic proteins bax and cytochrome c. Moreover, HL-60 cells treated with I'm-Yunity™ (PSP) also showed a diminished p65 and p50 forms of transcription factor NF-κB, which paralleled the reduced expression of COX2. We further observed that suppression of HL-60 cell growth was positively correlated with an increase in signal transducer and activator family of transcription factors STAT1, and conversely, with reduction in the expression of activated form of ERK. We postulate that the observed cell cycle and apoptogenic/anti-apoptotic and extracellular signaling regulatory protein expression changes resulting from treatment by water extracts of I'm-Yunity™ (PSP) are mechanistically linked to its reported clinical attributes and general health beneficial effects. I'm-Yunity™ (PSP) was supplied by ICM Holdings Ltd. (Hong Kong, China), as a mushroom product produced from deep-layer cultivated mycelia of Cov-1 according to Good Manufacturing Practice (GMP) standards. Briefly, following a 2.5–3 day batch fermentation culture , the biomass containing mycelia was extracted with hot water at 95°C for 4–5 h. The aqueous extract was differentially precipitated with ethanol, and fractionated using a proprietary scheme for enriching and retaining bioactive polysaccharo-peptides with molecular weights >40-kDa and an average polysaccharide:peptide ratio of 2:1 . Additional quality control of I'm-Yunity™ (PSP) involved determination of heavy metal contents, microorganism contamination, authentication of elution profiles on high pressure liquid chromatograph, and supplementary bioactivity-guided assays, performed by laboratories at the manufacturing facilities and also independently as coded samples by commercial testing centers. To prepare water extracts of I'm-Yunity™ (PSP), contents of each capsule (containing 340 mg powder) were suspended in 3.3 ml of water. The suspension was stirred with intermittent mixing at 150 rpm for 60 minutes at room temperature. The insoluble material was removed by centrifugation in a micro-centrifuge. The soluble supernatant was sterilized by passing through a 0.22 μm filter and kept in aliquots at 4°C. Water extracts of I'm-Yunity™ were analyzed by SDS-PAGE followed by staining with Coomassie blue, also using the Schiff's reagent from Sigma (this reagent is modified from the Periodic acid-Schiff (PAS) method and is designed to identify glycoproteins), and with Rapid-Ag-Stain from MP Biomedicals (Figure 1A–C). 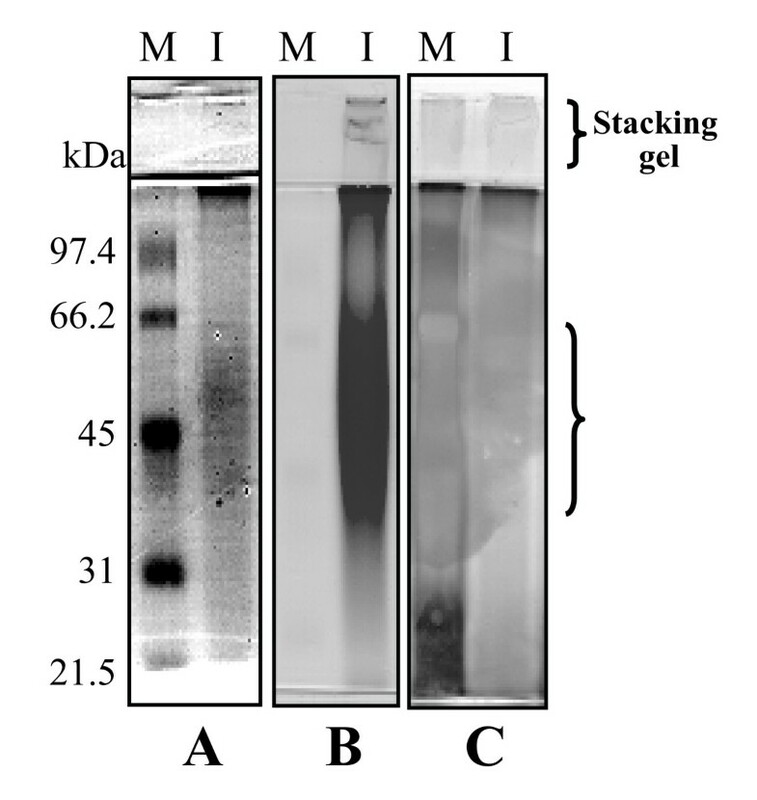 Staining with Coomassie blue revealed a major and minor band migrating with average molecular weights of 45-kDa and 35-kDa, respectively (Figure 1A). Gels stained with the Schiff's reagent showed a magenta pattern with a very light pink background; the most intensely stain corresponded to a very broad protein band migrating in the vicinity of >45-kDa (Figure 1B). Silver staining did not produce a distinct pattern (Figure 1C). As a whole, these results supported the interpretation that water extracts of I'm-Yunity™ (PSP) contain highly heterogeneous polysaccharo-peptides, with variable carbohydrate moieties linked to different side chain monosaccharides. Analysis of constituents of water extracts of I'm-Yunity™ (PSP) by SDS-PAGE and staining with Coomassie blue (panel A), Schiff's reagent from Sigma (panel B), and silver staining reagent from MP Biomedicals (panel C). In each panel, lane M corresponds to the staining pattern of protein markers, with arrows pointing to the position of migration of different molecular weight proteins. Correspondingly, lane I shows the migration of samples of water extracts of I'm-Yunity™ (PSP) after they were separated on 10% SDS-PAGE. The patterns revealed by different stains support the interpretation that I'm-Yunity™ (PSP) is a family of heterogeneous carbohydrate-containing polypeptides. Human HL-60 and U-937 leukemia cells were obtained from the American Type Culture Collection (ATCC, Rockville, MD), and cultured as described [5, 28, 32–35]. For treatment of either cell type, the stock aqueous extract of I'm-Yunity™ (PSP) was first diluted in tissue culture media and then added to cultured cells to give the final indicated doses. In a typical experiment, 5 ml of cells at a density of 1 × 105 cells/ml were seeded in T25 flasks. Next, different amounts of aqueous extracts of I'm-Yunity™ (PSP) were added into the culture media. At the specified times, control and treated cells were harvested. Cell count was performed using a hemocytometer and cell viability was determined by trypan blue exclusion [5, 28, 34, 35]. In addition, cell viability of control and treated cells was also measured using the MTT assay . Harvested cells were washed twice with PBS, and pellets were stored at -80°C for additional biochemical and molecular analyses. Cell cycle phase distribution was assayed by flow cytometry. Following a 3-day treatment of HL-60 or U-937 cells with different amounts of water extract of I'm-Yunity™ (PSP) (0.1, 0.5, and 1.0 mg/ml), cells were washed with PBS and stained with 1.0 μg/ml DAPI containing 100 mM NaCl, 2 mM MgCl2 and 0.1% Triton X-100 (Sigma) at pH 6.8, as described [28, 32, 36–38]. The DNA-specific DAPI fluorescence was excited with UV light emitting laser (Ni-Cad), and collected with appropriate filters in an ICP-22 (Ortho Diagnostic, Westwood, MA) flow cytometer. MultiCycle software from Phoenix Flow Systems (San Diego, CA) was used to deconvolute the cellular DNA content histograms to obtain quantitation of the percentage of cells in the respective phases (G1, S and G2/M) of the cell cycle. Flow cytometry was also used to show cells undergoing apoptosis, evident by the appearance of the sub-G1 peak [32, 39]. COX2 mRNA expression was assayed using semi-quantitative RT-PCR or quantitative real-time PCR [34, 40–42]. Total cellular RNA was isolated from day 3 control and I'm-Yunity™ (PSP) treated HL-60 cells using TRIzol reagent (InVitrogen) according to protocols provided by the manufacturer. RNA purity and quantitation was determined by agarose gel electrophoresis and A260/280 absorbance ratio. First strand cDNA synthesis used 2 μl total RNA incubated at 42°C for 50 min with Superscript RNase H- reverse transcriptase (InVitrogen). A 10-fold diluted cDNA served as the template for PCR. To amply and quantitate the human COX2 gene, PCR was performed using the Lightcycler PCR system (Roche Diagnostics, Mannheim, Germany) in glass capillaries in a final volume of 20 μl with addition of 1× Lightcycler master mix, 3 mM MgCl2, 1 μM of COX2 primer sets (sense 5'-ATG GGG TGA TGA GCA GTT GT-3' and antisense 5'-TGA GGC AGT GTT GAT GAT TTG-3'), and 2 μl of cDNA template or external standard template. The amplification reaction consisted of heating samples at 95°C for 30 s followed by 40 cycles of heating at 20°C/s to 95°C with a 1-s hold, cooling at 20°C/s to 55°C with a 1-s hold, and heating at 20°C/s to 72°C with a 10-s hold. A melting curve was generated by heating the product at 20°C/s to 95°C, cooling it at 20°C/s to 60°C, and slowly heating at 0.2°C/s to 95°C, with fluorescence collection at 0.2°C intervals. Human COX2 was amplified by conventional PCR and cloned into PCR 2.1-TOPO vector (InVitrogen) for transformation in TOP10 competent cells. Plasmid DNA containing human COX2 was purified using the Mini Plasmid Extraction Kit (Qiagen, Valencia, CA). Real-time PCR was performed using the Light Cycler DNA Master SYBR Green 1 kit according to manufacturer's instructions. Ten fold serial dilutions of the purified plasmid DNA containing 100 to 107 copies of COX2 in 2 μl were used as standards to calculate COX2 mRNA copy number, which is expressed as % of control. The data obtained were analyzed using the Lightcycler software provided by the manufacturer. Only log-linear portion of amplification was chosen for analysis. Experiments were performed in duplicate. Cells were suspended in buffer (50 μl/106 cells) containing 50 mM Tris-HCl, pH 7.4, 150 mM NaCl, 1% Triton X-100, 1% sodium deoxycholate, 0.1% SDS, 1 mM EDTA, 1 mM PMSF, 5 μg/ml each of aprotinin, pepstatin, leupeptin, and lysed by 3 freeze/thaw cycles [33, 42, 43]. The extracts were centrifuged and the clear supernatants were stored in aliquots at -70°C. Ten to 20 μg of proteins were separated on 10% SDS-PAGE. Membranes were probed for expression of Rb, poly(ADP-ribose) polymerase (PARP), bcl-2, survivin, bax, cytochrome c, p50 and p65 forms of NF-κB, STAT1, ERK, and β-actin. Commercial antibodies (from Santa Cruz Biotechnology, Inc.) were used at a dilution of 1:1000. Immunoreactivity was demonstrated by enhanced chemiluminescence (ECL) or color reaction, using the manufacturer's protocol (Kirkegared & Perry Laboratories). Cytosolic and mitochondria fractions were obtained using the Mitochondria isolation kit from Sigma. Harvested control and treated cells washed with ice-cold PBS were suspended in extraction buffer containing 10 mM Hepes, pH 7.5 supplemented with 200 mM mannitol, 70 mM sucrose, 1 mM EGTA, and 0.5 mg/ml BSA. The cell suspension was homogenized by 30 passages through a 25-gauge needle. The homogenate was centrifuged at 600 × g, 5 min and the supernatant transferred to a fresh tube. Further centrifugation of the supernatant at 11,000 × g, 10 min yielded a cytosolic supernatant and a mitochondria pellet. The pellet was resuspended in extraction buffer and centrifuged at 11,000 × g, 10 min. The mitochondria pellet was resuspended in 10 mM Hepes, pH 7.4 containing 250 mM sucrose, 1 mM ATP, 0.08 mM ADP, 5 mM sodium succinate, 2 mM K2HPO4, and 1 mM dithiothreitol. 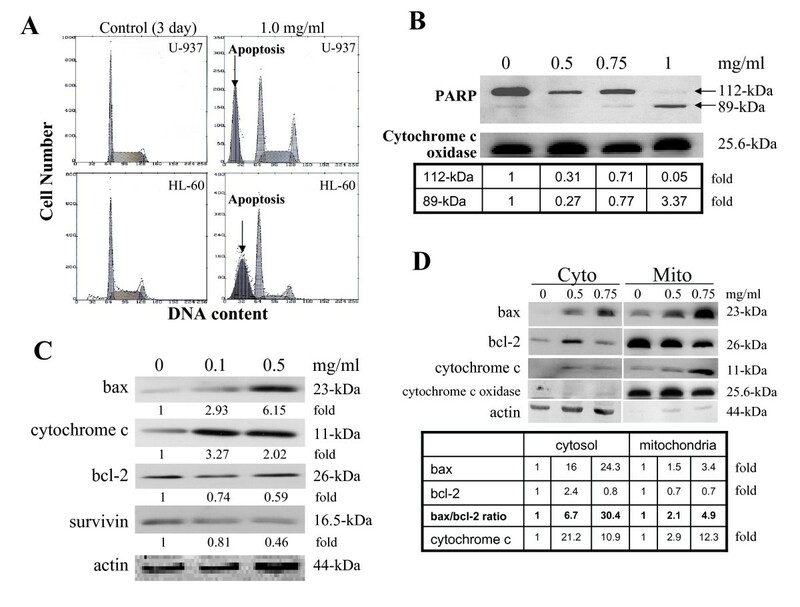 Efficiency of separation of cytosolic and mitochondrial fractions was confirmed by gel electrophoresis and immunoblotting using the mitochondria specific cytochrome c oxidase antibody (from Molecular Probes). In previous studies, we demonstrated in HL-60 cells that aqueous extracts of I'm-Yunity™ (PSP) exerted more potent growth inhibitory and apoptosis-inducing effects, compared to 70% ethanolic extracts . Moreover, the reduction in proliferation was accompanied by accumulation of cells in G1 simultaneous with a reduction in proportion of cells in the S phase . To investigate whether the growth inhibitory effects of aqueous extracts of I'm-Yunity™ (PSP) can be extended to other myeloid leukemia cells, increasing concentrations of water extracts was added to U-937 cells. A 72 h treatment resulted in significant inhibition of cell proliferation (Figure 2A). Time course studies showed that suppression of growth was evident as early as 24 h after treatment (data not shown). Furthermore, suppression of proliferation was accompanied by a decrease in cell viability using high but not low doses (Figure 2B) of water extracts of I'm-Yunity™ (PSP), suggesting that the polysaccharo-peptide exerts complex anti-cellular effects in the U-937 cells. 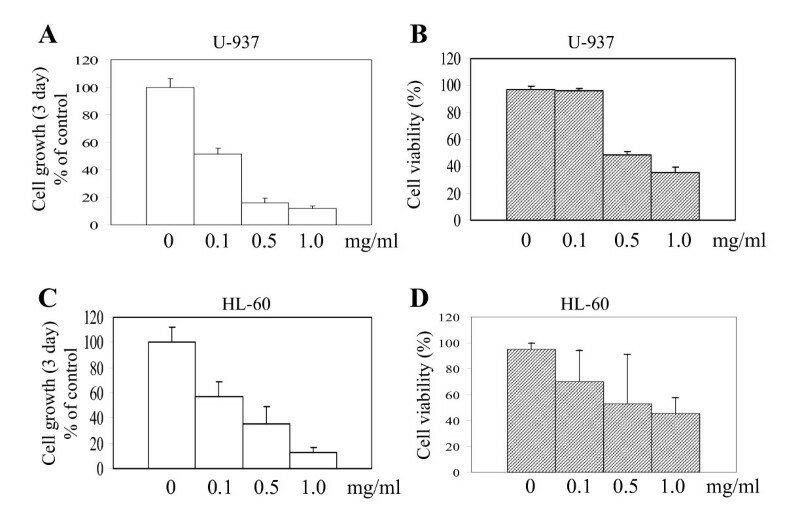 Similar to our previous observations , treatment of HL-60 cells with the same dose range of water extracts of I'm-Yunity™ (PSP) was accompanied by a pronounced inhibition of cell growth and viability (Figure 2C and 2D). Control of cell growth and viability in U-937 and HL-60 cells by water extracts of I'm-Yunity™ (PSP). Both cell types were cultured and treated with different dose of I'm-Yunity™ (PSP) as described in Materials and Methods. Panels A and C show suppression of proliferation of U-937 (panel A) and HL-60 (panel C) cells by increasing concentrations of I'm-Yunity™ (PSP). Panels B and D show reduction of cell viability in U-937 (panel B) and HL-60 (panel D) by I'm-Yunity™ (PSP). Results in panels A-D represent average ± SD of 3–4 experiments. To explore further the manner by which extracts of I'm-Yunity™ (PSP) affected cell growth in these two cell types, flow cytometric analysis was performed and the results illustrated in Figure 3A. In U-937 cells, low dose (0.1 mg/ml) induced an accumulation of cells in the S phase, concomitant with a decrease in proportion of cells in the G1 phase (Figure 3A). At higher concentrations (0.5 and 1.0 mg/ml), however, a reduction in S phase, together with an increase in G2M phases of the cell cycle was observed. These results provide further support for the notion that a complex mechanism underlies the interaction between extracts of I'm-Yunity™ (PSP) and U-937 cells. 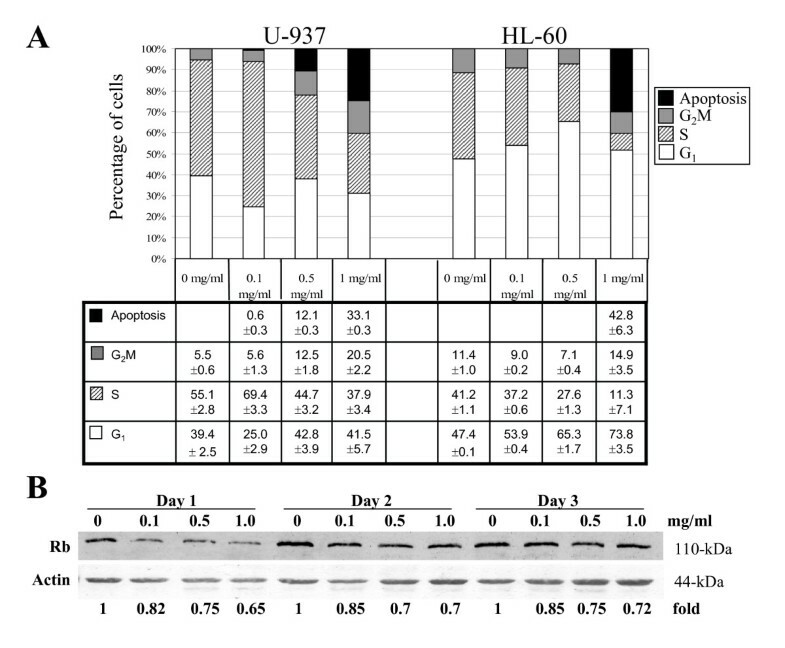 In HL-60 cells, however, a dose-dependent increase in G1, accompanied by a marked reduction in S phase of the cell cycle resulted from treatment with water extracts of I'm-Yunity™ (PSP) (Figure 3A). These results raise the possibility that water extracts of I'm-Yunity™ (PSP) target both cell cycle checkpoints, as a likely contributing factor for its anti-proliferative activities in tumor cells. To gain further insights on how water extracts of I'm-Yunity™ (PSP) might trigger G1/S cell cycle arrest in HL-60 cells, we determined the expression of the retinoblastoma gene product Rb, known to play a pivotal role in controlling the G1/S phase transition via a cyclin kinase-mediated, switch on/off mechanism of the binding of transcription factor E2F [33, 43, 44]. Immunoblot analysis showed a dose-dependent inhibition of Rb expression in treated cells (Figure 3B). The extent of reduction of Rb was correlated with the observed cell cycle changes, suggesting that the attenuation of Rb expression likely plays a critical role in restricting cell progression from G1 to S phase, in HL-60 cells. Effects of water extracts of I'm-Yunity™ (PSP) on cellular DNA content frequency histograms showing the cell cycle phase distribution changes and induction of apoptosis in U-937 and HL-60 cells treated for 3 days of treatment with 0, 0.1, 0.5 and 1.0 mg/ml I'm-Yunity™ (PSP) are presented in panel A. Flow cytometric analysis was performed as described in Materials and Methods and results shown represent average ± SD of 2 separate experiments. Panel B. Effects of I'm-Yunity™ (PSP) on Rb expression in treated HL-60 cells. Relative changes in expression of Rb in control and days 1–3 treated cells were determined by Western blot analysis as described in Materials and Methods. The intensity of the Rb and actin immunoreactive bands was quantitated by densitometry and the actin-adjusted Rb expression levels are presented as fold differences, with the control value for each day of treatment showing as 1. Treatment with high dose (1.0 mg/ml) of water extracts of I'm-Yunity™ (PSP) for 3 days also resulted in the induction of apoptosis in both U-937 and HL-60 cells, as evident by the appearance of cells displaying fractional DNA contents in flow cytometric analysis (Figure 4A), and further supported by the cleavage of DNA repair enzyme PARP from its native 112-kDa form to an inactive 89-kDd product (Figure 4B). Since disruption of the mitochondria, accompanied by changes in the relative subcellular distribution of apoptogenic and anti-apoptotic regulatory proteins, has been suggested as being among the key events that occur during apoptosis [37, 45–50], we analyzed in detail changes in expression of apoptogenic and anti-apoptotic proteins, notably, bax, cytochrome c, survivin, and bcl-2. Figure 4C shows composite changes in these proteins in day 3, 0.1 and 0.5 mg/ml I'm-Yunity™ (PSP)-treated whole cell lysates. A pronounced increase in bax and cytochrome c was clearly observed, which corresponded to significant decreases in levels of bcl-2 and survivin. As additional proof of the observed protein changes, we analyzed bax, bcl-2 and cytochrome c in the mitochondria and cytosolic fractions. Figure 4D shows dose-dependent increases in the expression of bax in mitochondria and correspondingly cytochrome c in the cytosol; purity of separation into the respective subcellular compartments was supported by the distinctive presence of cytochrome c oxidase in the mitochondria and its absence in the cytosolic fraction. Induction of apoptosis is further demonstrated by dose-dependent I'm-Yunity™ (PSP)-elicited increase in ratio of bax/bcl-2 (Figure 4D). Dose-dependent increase of bax and correspondingly, reduction in bcl-2 expression can be detected as early as 30–36 hours after treatment (data not shown). Changes in cell cycle phase distribution and apoptogenic/anti-apoptotic regulatory proteins in control and I'm-Yunity™ (PSP)-treated HL-60 cells. Panel A. Cellular DNA content frequency histograms showing the cell cycle phase distribution changes of U-937 and HL-60 cells following 3 day treatment with 1.0 mg/ml doses of I'm-Yunity™ (PSP). Flow cytometric analysis was performed as described in Materials and Methods. Induction of apoptosis in treated cells is illustrated by cells showing fractional DNA content. Panels B-C, changes in apoptogenic/anti-apoptotic proteins in control and 3 day I'm-Yunity™ (PSP)-treated HL-60 cells. Expression of bax, cytochrome c, bcl-2, survivin, and PARP, identified by their respective molecular weights, was determined by immunoblot analysis, then adjusted for protein loading using cytochrome c oxidase in panel B, or actin in panel C, and presented as fold differences, with the control value showing as 1. Panel D, changes in bax, bcl-2 and cytochrome c in the cytosolic and mitochondria fractions separated using the procedure detailed in Materials and Methods. Expression of the various proteins was adjusted for loading using either cytochrome c oxidase (for mitochondria fraction) or actin (for cytosolic fraction) and presented as fold differences, with the control value showing as 1. The adjusted bax and bcl-2 values were used to calculate the ratio of bax/bcl-2 expression. NF-κB is a transcription factor that has been implicated in the control of cell growth [51–53]. Constitutive activation of the NF-κB family of transcription factors in various human tumors has been hypothesized to contribute to the development and/or progression of malignancy by regulating the expression of gene sets involved in cell growth and proliferation, circumvention of apoptosis, and the induction of angiogenesis and metastasis [52, 53]. We therefore measured changes in the steady state level of NF-κB in HL-60 cells treated with water extracts of I'm-Yunity™ (PSP). Pronounced decreases in p65 form and to a lesser degree also p50 form of NF-κB was found in I'm-Yunity™ (PSP)-treated HL-60 cells in day 3, varying doses of I'm-Yunity™ (PSP)-treated cells (Figure 5A). Figure 5B showed the quantitive determination of changes in both p65 and p50 forms of NF-κB using a single dose of 0.5 mg/ml water extracts of I'm-Yunity™ (PSP). Regulation of expression of NF-κB in HL-60 cells by water extracts of I'm-Yunity™ (PSP). Control and 3 day I'm-Yunity™ (PSP) treated cells were harvested and total protein extracts were prepared, separated by SDS-PAGE and analyzed for expression of NF-κB p65, p50 and actin by immunoblot analysis (panel A). Time-dependent changes in actin-adjusted, NF-κB expression by water extracts of I'm-Yunity™ (PSP) are shown in panel B.
NF-κB is involved in transcriptional control of cyclooxygenase 2 (COX2) [54–57]. Therefore, to obtain information on functional consequences associated with the suppression of NF-κB by I'm-Yunity™ (PSP), we determined COX2 expression using quantitative real-time and semi-quantitative RT-PCR. Results in Figure 6 showed that HL-60 cells treated with water extracts of I'm-Yunity™ (PSP) were accompanied by a 65–85% reduction in COX2 expression, depending on the assays used. Suppressed expression of COX2 in HL-60 cells by water extracts of I'm-Yunity™ (PSP). 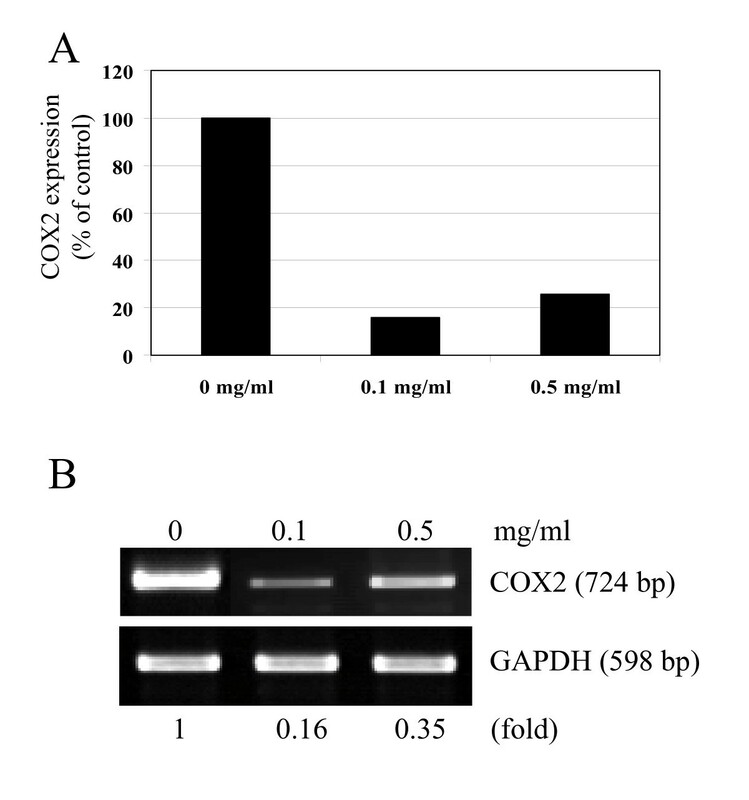 Control and treated cells were harvested and expression of COX2 was determined quantitatively by real-time PCR (panel A) and semi-quantitatively by RT-PCR (panel B). Semi-quantitative expression of COX2 in panel B was also adjusted using expression of GAPDH and presented as fold differences, with 1 representing the value in control cells. Survival of cells in multicellular organisms is inextricably linked to and dependent on cues from extracellular growth factors. Availability of growth factors and signaling events they elicit contribute to the homeostatic balance between cell proliferation and death. In tumor cells, their endowment with oncogenes together with the hyperactive status of oncogene products often result in amplified and/or persistently activated growth and survival pathways. Cultured tumor cells incubated with extracts of I'm-Yunity™ (PSP) are accompanied by significant changes in the expression of several important growth modulators and cytokines . Similarly, patients treated with I'm-Yunity™ (PSP) showed increases in interferon-γ expression, a cytokine known to have profound immune regulatory properties . Conceivably, interferon-γ could contribute to the suppression of tumorigenesis indirectly, through modulation of the immune system, as well as directly by exerting anti-proliferative and pro-apoptotic effects. Both mechanisms, in principle, may invoke regulation of gene expression mediated through the STAT (signal transducer and activator of transcription) proteins [58–62]. Recent studies have shown, for example, that STAT1, as a member of the STAT protein family, plays a vital role in the control of apoptosis; namely, lymphocytes from STAT1-/- mice failed to undergo apoptosis, had reduced cytokine processing and apoptogenic proteins caspase 1 and 11, and demonstrated increased proliferation in vitro, compared to cells from wild-type animals . It is therefore of interest to determine whether treatment of HL-60 cells with water extract of I'm-Yunity™ (PSP) may lead to changes in STAT1. Immunoblot analysis showed a dose-dependent STAT1 increase in day 3, I'm-Yunity™ (PSP)-treated cells (Figure 7). In contrast, analysis of another prominent survival pathway, mediated by the extracellular signal-regulated kinase (ERK), showed that treatment with I'm-Yunity™ (PSP) reduced levels of activated, phosphorylated ERK, while total ERK was unchanged, compared to control cells (Figure 7). Relative changes in STAT1 and ERK levels in I'm-Yunity™ (PSP)-treated HL-60 cells. 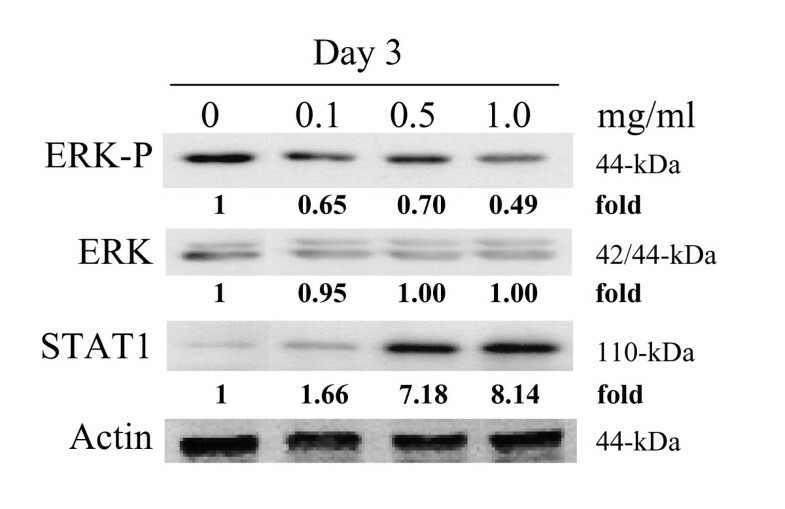 Control and treated cells were harvested and total protein extracts were prepared, separated by SDS-PAGE and analyzed for expression of STAT1 and ERK by western blot analysis, with actin expression used to adjust for protein loading. A significant percentage of the estimated two million deaths recorded in the United States each year are attributable to cancer and its ensuing complications. Cancer presents clinically as a constellation of diseases and at all stages – from primary prevention to treatment – can be profoundly and significantly affected by nutrition and diets. The existence of such a link is well supported by decades of epidemiological studies showing that the consumption of plant-based diets is directly associated with reduced risk of cancer [64–76]. The impact of nutrition and diets in prevention of carcinogenesis is formally conceptualized in chemoprevention by Sporn and others in the 1970s, which emphasizes the use of pharmacologic or natural agents to inhibit development or progression of invasive cancer [67–69, 71, 72, 74, 77–79]. Research in recent years has begun to focus on "bioactive compounds" in diets with chemopreventive attributes and delineation of their mechanism(s) [67, 70, 72]. Efficacy of chemopreventive agents may have multiple mechanistic bases: reversal of abnormal differentiation, suppression of cell replication/growth, and induction of apoptosis. Additionally, inhibition of carcinogen activation and increase in their removal by detoxification enzymes are also considered prudent cancer prevention strategies [71, 72, 74]. Since many of the very same chemopreventive attributes are found in I'm-Yunity™ (PSP), we propose that it, as an example of mushroom and mushroom products, may be included in this category of dietary agents. Indeed, based results from this communication and earlier studies, it may be suggested that I'm-Yunity™ (PSP) is an easily compliant adjunctive treatment particularly germane to human leukemia and other blood-borne hematologic malignancies. Since polysaccharide moieties predominate in I'm-Yunity™ (PSP), it is possible that less chemo- and radio-resistant clones will result from treatment using such an agent. The cellular changes reported in this communication as a result of treatment with water extracts of I'm-Yunity™ (PSP) can be explained by the multiple effects it elicits, which include suppression of the retinoblastoma tumor suppressor protein Rb, increased release of cytochrome c from mitochondria to the cytosol, reduced expression of anti-apoptotic protein bcl-2 and survivin, and simultaneously, increase in bax, as well as a disruption in cell signaling events, as collectively depicted in the scheme in Figure 8. Proposed mechanism of action of I'm-Yunity™ (PSP). In this model, the ability of water extracts of I'm-Yunity™ (PSP) to inhibit cell proliferation and induce apoptosis in cancer cells is hypothesized to involve multiple effects, including 1) disruption of cell cycle control machinery, 2) perturbation in apoptogenic/anti-apoptotic regulatory protein expression promoting the induction of apoptosis, 3) alteration in mitogenic signaling pathways, 4) regulation of gene expression, exemplified by suppression of cell survival transcription factor NF-κB. A number of new molecular targets and mechanistic insights have surfaced from the present studies. First and foremost is the observation that I'm-Yunity™ (PSP) down-regulates the expression of NF-κB in HL-60 cells, thereby identifying a new, novel molecular target of this family of bioactive polysaccharo-peptides. 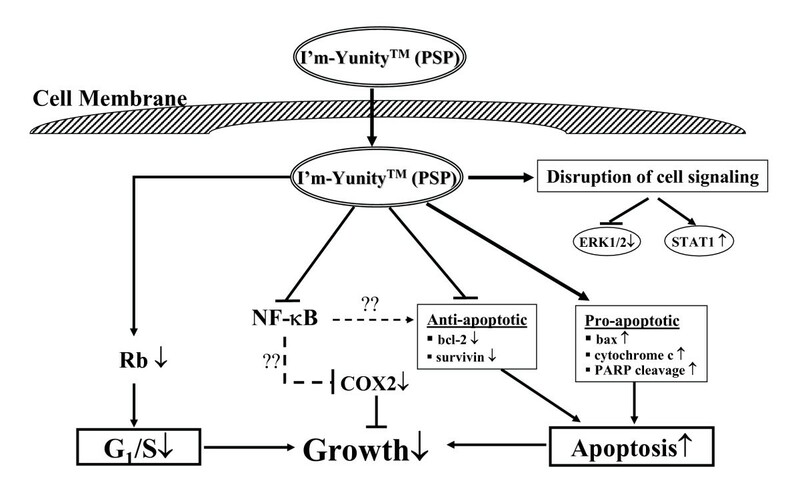 It is noteworthy that the effect of I'm-Yunity™ (PSP) on NF-κB correlated well with the suppression of growth, suggesting a causal relationship. NF-κB is a transcription factor known to be functionally associated with cell survival; its constitutive activation in various human malignancies contributes to tumor transformation, development, and progression. These effects may relate to the ability of NF-κB to control the transcription of genes involved in cell growth and proliferation, suppression or escape of apoptosis, acquisition of new vasculature and blood supply, and dissemination to distant location for further growth and colony formation [52–56]. Treatment of HL-60 cells with water extract of I'm-Yunity™ (PSP) caused a precipitous reduction in p65 and to a lesser degree also p50 subunits of NF-κB (Figure 5). This finding is significant since it proffers the notion that this family of polysaccharo-peptides acts in part by forestalling a pivotal factor required for the survival and propagation of tumor cells. The more pronounced decline in p65 relative to p50 may relate to the fact that these two subunits of NF-κB are known to be different gene products and not necessarily regulated in a coordinate fashion. Studies have shown, for example, that p50 is proteolytically derived from a p105 precursor and hence, in principle, could be subjected to more complex mechanism of control, compared to the p65 subunit. Taking these into consideration, it is entirely possible that the p65 and p50 subunits are differentially regulated depending on the dose of I'm-Yunity™ (PSP) used for treating the cells. Conceivably, therefore, low rather than high doses of I'm-Yunity™ (PSP) are effective in suppressing the expression of the p50 subunits. In contrast, a broader dose range of I'm-Yunity™ (PSP) affects the expression of the p65 subunit. It should also be pointed out that our findings do not necessarily contradict the role of I'm-Yunity™ (PSP) as an immune modulator, and similarly, other data pointing to NF-κB as a tumor suppressor rather than a promoter of tumorigenesis [52, 54]. It may well be that in normal immune cells, I'm-Yunity™ (PSP) at an appropriate dose range does indeed increases the expression of NF-κB and thereby promotes the increased transcription of genes in immune cells conducive to a heightened immune status. The same cell type consideration may equally apply to recent evidence showing that NF-κB can function as a tumor suppressor by actively repressing anti-apoptotic genes. The acquisition of a non-conventional role for NF-κB, i.e., functioning in tumor suppression rather than promotion, may also depend on stimuli impinging on cells, and just as plausible, the co-expression of genes acting in concert with NF-κB to facilitate transcriptional repressor of anti-apoptotic genes. It has been demonstrated, for example, that ARF (ADP-ribosylation factor) and p53 as well as certain inducers of NF-κB DNA-binding activity, such as ultraviolet light and some chemotherapeutic compounds, can induce the association of NF-κB subunits with transcriptional corepressor complexes, allowing them to function as repressors rather than activators of gene expression [80–82]. Whether these considerations can apply to HL-60 cells, known to have p53-null status but do express the ARF [83–89], in the context of cellular effects elicited by I'm-Yunity™ (PSP) remain to be studied. 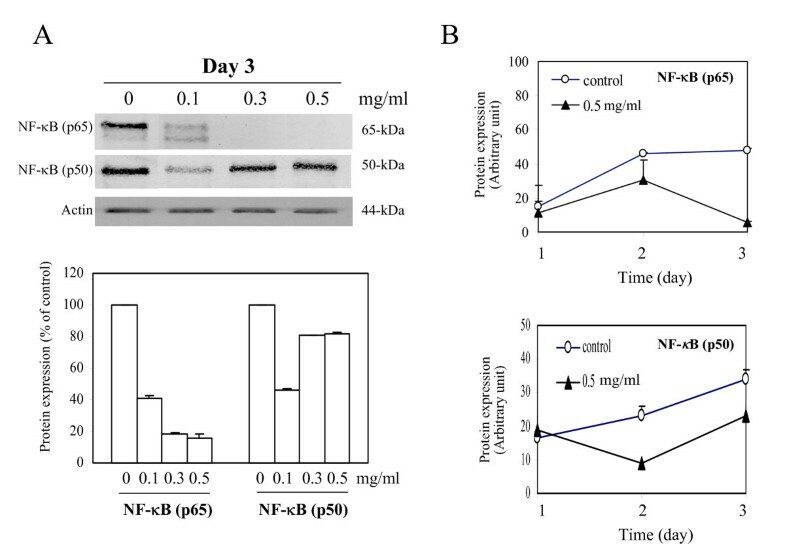 Further research will also focus on investigation of detailed changes in steady state levels and subcellular distribution of NF-κB, using control and treated cells harboring a stably transfected dominant-negative IκB gene in which amino acid serine at positions 32 and 34 of IκB is mutated to amino acid alanine. These changes should exclude its phosphorylation by IκB kinase, which is required for the degradation of IκB, coincident with the cytoplasm-to-nucleus translocation of NF-κB [51, 90, 91]. A second new finding revealed in the present studies is the ability of I'm-Yunity™ (PSP) to down regulate COX2 expression. Persistent chronic inflammation plays an important role in carcinogenesis [92–94]. In the early phase of inflammation, COX2 facilitates the production of inflammatory prostaglandins. COX2 has been shown to be overexpressed in a variety of cancers [95–97]. Further, there is compelling evidence from in vitro experimental studies that inhibition of COX2 decreases cellular proliferation, increases apoptosis, and modulates genes involved in cell cycle regulation [93, 94]. Therefore we measured COX2 expression in control and treated cells. Results in Figure 6 show that COX2 expression was significantly suppressed by treatment with water extracts of I'm-Yunity™ (PSP). A third important observation relates to the modulation of potent signaling molecules by I'm-Yunity™ (PSP), as exemplified by an increase the expression of STAT1 in parallel with the suppression of the phosphorylated form of ERK (Figure 7). STATs and their protein partners JAKs (Janus kinases) are evolutionarily conserved signaling and cellular communication molecules that enable cytokines to mount a repertoire of host defenses and immunological responses. Similarly, ability of cells to respond to extracellular challenges also depend upon signaling pathways governed by the MAP kinase modules, with sequentially acting protein kinases including ERK as the archetypal form. In both examples, interaction of ligand or an external challenge with membrane-associated receptors are considered to be key initiation events. Because of the importance of the STAT and ERK signaling pathways in homeostatic control of cells, as discussed, it is of interest and pertinent to ask how they might be affected by I'm-Yunity™ (PSP). One possibility is that I'm-Yunity™ (PSP), having structural similarity to proteoglycans , act directly as agonists/antagonists of specific surface receptor ligands, and in turn, augment the trigger of the JAK/STAT signaling pathway while concurrently dampen the events directed to the ERK signaling cascade. A second possibility is that I'm-Yunity™ (PSP) functions as a growth factor/cytokine decoy to sequester/trap the relevant growth factor/cytokine required for HL-60 cellular function, or bind the pertinent receptor in ways that block further engagement and interaction with their physiological, cognate ligands. This possibility may be supported by structural resemblance existing between the bioactive constituents present in I'm-Yunity™ (PSP) with proteoglycans occurring in the extracellular matrix of cancer cells . As mentioned in the Introduction, a broad spectrum of bioactive molecules, ranging from those with defined structures and functions, e.g., proteases, nucleases, to others with heterogeneous structures and ill-defined activities, e.g., polysaccharo-peptides and polysaccharides, have been identified and isolated from mushrooms [2, 4, 99, 100]. Finally, it is possible that I'm-Yunity™ (PSP) exerts its effect on STAT1 and ERK by disrupting intracellular signaling events, secondary to its internalization that may involve the formation of a complex between the polysaccharo-peptides with specific components in the serum to facilitate its uptake into cells. This mechanism may draw analogy from lipid-mediated delivery of highly charged and heterogeneous plasmid DNA into cultured mammalian cells and as vaccines , as well as the intestinal absorption of oral heparin (a heterogeneous, charged mucopolysaccharide) [102–104] or heparan sulfate, e.g., chondroitin sulfate [105–107]. Notably, some of these possibilities can be tested experimentally and are being considered for further investigation in our laboratory. Treatment of human leukemia cells by water extracts of I'm-Yunity™ (PSP) causes cell cycle arrest and alterations in the expression of apoptogenic/anti-apoptotic and extracellular signaling regulatory proteins, the net result being a reduction in proliferation and an increase in apoptosis. These findings may be part of the mechanisms that underlie or contribute to its reported clinical attributes and overall health benefits. Peili Wu, Spencer Park contributed equally to this work. Research in this report was supported in part by an unrestricted grant from the Hong Kong Healthcare Center Ltd. We acknowledge with thanks the unwavering support Ms. Vivien Chou and her family has provided for mechanistic studies of Chinese herbals in preventing and treating chronic diseases. TCH carried out tissue culture and flow cytometric studies using the core facilities at the Brander Cancer Institute of New York Medical College. TCH designed and performed the real-time PCR analysis with assistance from a former post-doctoral fellow Xiaohua Lu. PW isolated and purified cytosol from mitochondria and performed immunoblot analysis of the isolated fractions in the revision of the paper. SP performed immunoblot analysis using whole cell lysates in the revision of the paper. TCH and JMW designed the experiments and wrote the paper. All authors read and approved the final manuscript.